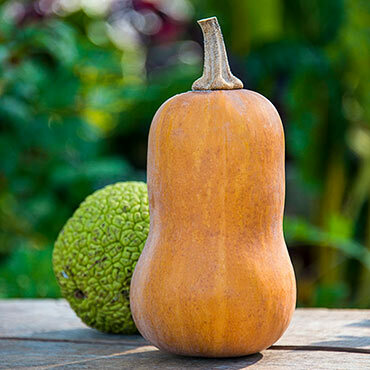 With a delectable, sugary-sweet flavor and long shelf life, each Winter Honeynut squash can serve up to two people for a delicious, dessert-like entree or side. You'll harvest loads of these 5" mini butternut squashes from their 7-10' vines. Each squash will weigh in at .5-1 lb, with a uniform shape and size. When ripe, its skin will be tan, with a uniform orange flesh. Resistant to Powdery Mildew, Honeynut was developed by the Vegetable Breeding Institute at Cornell University. Plant in rich, moist, well-drained soil in full sunlight, with two plants per hill, and 8-10' between hills. 110 days to maturity.